AAAAHHHHH!!! I know the article did have Spoilers alert but it makes me more curious especially its about the Incredible Hulk movie. After reading the spoilers. I feel like the Hulk already smashing the ground. I want to pass my curse. Here is the spoiler. Don't say I didn't warn you. * The Arctic. A MAN wearing disembarks from a tug boat and heads off into the remote wilderness. As he wanders through the ice, memories flash: a woman on the ground, flames – fuzzy and fleeting. At last he stops and removes his parka revealing a gun at his waist. His heart races as takes it in his hands and pulls the hammer back. A slight GREEN envelopes him. * A gunshot. The man falls forward, but his arms rush out to catch him: huge, muscled, green arms. The hands reach up the man’s head and come down, holding a bullet, totally flattened. We pull back and a roar echoes through the arctic wilderness. * Five years later. Brazil. BRUCE BANNER runs through the slums of Porto Verde, a pulse monitor keeping careful track of his heart rate, making sure he doesn’t get too excited. He drops by a shop to pick up a package – inside is a book on rare South American flowers. At a computer terminal, he sends a message to MR. BLUE thanking him for the book and explaining that he still has to find the flower – Bruce signs it MR. GREEN. * A few days later, Bruce enters a primitive bottling plant, putting on gloves and glasses like the rest of the Brazilian laborers around him. During beak time, Bruce talks to a supply driver who hands him a package with a leaf in it. Excited, Bruce checks his now-worn flower book and smiles. * At his no-frills apartment, Bruce chats online with Mr. Blue. Blue asks Bruce if he has the notes on how to make the inhibitor and he replies that he does. Bruce then gets to work, using the few scientific implements he has. Hopeful, Bruce tests the purple liquid he got from the flowers on his own blood – but no change. He tells Blue it didn’t work; Blue suggests a stronger but potentially lethal dose, but Bruce replies that he doesn’t have any more. Blue then tells Bruce send him a sample of his blood. Bruce is hesitant… but decides it is his only option. He stares sadly at a picture of a beautiful woman, his wife, BETTY ROSS. * A few weeks later, in America, a woman prepares lunch for a group of children. The mother sips from a bottle – a moment later she spasms and falls to the ground, eyes rolling into the back of her head. * Later, at the office of GENERAL THUNDERBOLT ROSS, MAJOR CABOT reports that a woman got gamma sickness from a South American soda. Ross is intrigued by this. Cabot reports that it was bottled in Porto Verde, Brazil. Ross tells Cabot to get things ready – they’ve found him. * Ross watches his team prepare. They have photos of the area: the factory, Bruce’s apartment, etc. Cabot briefs the soldiers, a man named BLONKSKY leading point. She tells them that that Banner is a U.S. fugitive who stole military secrets and that they shouldn’t engage him. * Back at the bottling plant, some young RUFFIANS bother a pretty girl. Bruce does his best to ignore it, but at last steps up to defend her. The LEADER takes swings at Bruce, but he artfully dodges them. They leave, telling Bruce they’ll get him later. * At his apartment, Blue tells Bruce that there was success with a higher concentration. Bruce’s face shows hope, something he’s been waiting to hear for a long time. Bruce warns that his situation may be more complicated, but Blue seems confident that there’s a good chance it could cure him. He writes on a pad of paper: DATA FROM MAYNARD and sticks it in his pocket. Bruce packs up everything and sticks it in his pack for a quick escape, his nightly routine - just in case. * Ross’ team sneaks into area and breaks into the apartment. They attack Bruce in bed – but it’s a decoy. Bruce escapes and a chase ensues through the winding slums. Bruce makes his way to a bar near the factory, but runs smack into the punks from work. They chase after him into the factory while the soldiers also close in. Cornered, Bruce is beaten by the punks and, in cover of dark, he transforms into THE HULK. * The Hulk easily defeats the punks and soldiers and retreats into the jungle. Blonsky stares after him, in awe of the figure’s staggering size and strength. * Bruce makes his way north anyway he can. At last he crosses the border and hops a train, heading somewhere. * Ross and Blonsky meet with GENERAL GRELLER, his friend who helped him put together the South American job. Greller tries to wrap his head around what happened and tells Ross that something this powerful can’t be on the loose anymore. Afterwards, Blonsky insists he get answers about what happened, but Ross refuses. Blonsky, a decorated soldier, says he lost some friends of his and at last Ross gives in and explains everything. * Ross explains that Banner was part of an early experiment to create super soldier serum, but the funding was running out. In the eleventh hour of the project, Banner was so certain of his research that he tested it on himself – that’s when everything went to hell. Ross tells Blonsky that Banner is a scientist, not a soldier, and that he doesn’t understand that the power he holds belongs to the U.S. and should be used as a weapon. Ross then asks Blonsky if he’d be willing to take a shot of the serum, to have an edge against Banner when they face off again. Blonsky is more than willing. * Bruce goes to the university where Betty works – the same place his accident happened. Bruce sees her – with another man, SAMSON. * Bruce hides out with STAN, an old friend who owns a pizza place. He manages to sneak into his former lab at MAYNARD HALL (from the note) to find his old data, but finds it has all been erased. Later, as he discusses this with Stan, Betty and Samson come in. Betty catches a glimpse of Bruce and chases after him. They are reunited and Bruce agrees to go with her and Samson. * At Betty and Samson’s place, the three chat and Bruce smiles, the first time in a great while. He later talks to Samson, who explains he is a psychiatrist and even though he is sad Betty can’t be totally his, he is happy Bruce is alive. He also says that Betty has refused to talk about anything involving Bruce. Bruce says he hurt Betty and can never forgive himself for what happened, even though he would never let it happen again. Samson is still suspicious. * The next day, Betty goes to take Bruce to the bus station so he can go see Br. Blue, but Ross’ men get to him and a big battle ensues on the college campus. Betty pleads with her father to leave him alone, but Ross refuses to listen. The Hulk faces off against Blonsky, stronger and faster than before, but still no match for Bruce’s alter ego. * Badly wounded, the Hulk escapes with Betty, leaving behind a trail of destruction and a nearly-dead Blonsky. Enraged that the Hulk escaped and that his DAUGHTER is with him, Ross speaks with Samson, saying he did the right thing by calling. Samson wonders if he did, mentioning that the Hulk protected Betty better during the battle than her own father did. Samson informs Ross he won’t help him anymore and Ross storms off. 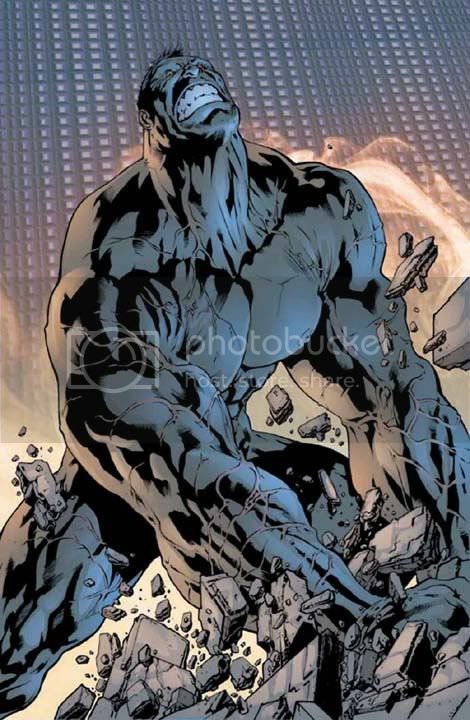 * Blonsky is badly wounded – every bone in his body broken. His doctor says that if Blonsky even survives, he’ll be paralyzed. * Bruce and Betty travel to see Dr. Blue, laying low in cheap motels and rekindling their love. Betty pawns her mother’s necklace for cash – Bruce feels bad but Betty says they’ll get it back someday. * Back at the hospital, Blonsky has made a remarkable recovery – not only has he healed entirely, but he is stronger and healthier than before. Ross gives him more shots and Blonsky smiles, a little too happy with his power. * Bruce and Betty arrive in New York City – Columbia University, the lab of Dr. Blue aka DR. STERNS. Meanwhile, Cabot figures out where the two were headed and warns Ross, who prepares his team for New York. En route, a soldier asks a ripped and muscular Blonsky how he feels – “Like a monster,” he replies. * Sterns attempts to treat Bruce. He is amazed and shocked by Bruce’s transformation as the procedure seemingly malfunctions; at last, Bruce turns back to himself, the treatment outwardly effective. * As the team prepares their assault, Sterns shows Bruce his creations – animals Sterns injected with Bruce’s DNA. Bruce is mad, saying they must all be destroyed lest they fall into the government’s hands. Sterns replies that Bruce is paranoid – just as a sniper shoots Bruce with a dart. Bruce falls and is taken captive, Betty following after. * Ross and his team fly away in a chopper, happy that they’ve finally caught him. But back at the lab, the steroid-filled Blonsky forces Sterns to inject him with Bruce’s DNA. * In the distance, the occupants of the copter notice a huge explosion – something wrong has happened at the lab. A huge, hulking creature is destroying New York – Blonsky has become… an ABOMINATION.